A traditional Ayurvedic consultation is used to assess how to use the five remedial home treatments for your improved health. 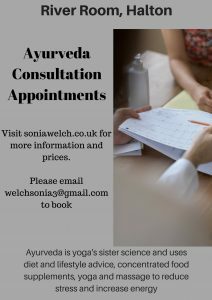 are given via email after your first consultation.The Ayurvedic consultation takes between 1 – 2 hours and is followed up by an email package of Ayurvedic recommendations. Please contact Sonia Welch here for more information or to book. As in all my classes, this is about more than working your body – everything we practice physically in yoga is intimately informed by an ancient, rich and fascinating philosophy going back thousands of years and yet more relevant today than ever. I weave aspects of this philosophy into the teaching of breathing techniques, physical postures, relaxation and meditation. Through my classes, my aim is for you to feel wonderfully stretched, spacious and strengthened, your breathing smooth and regular and with a deep sense of calm and alignment with what matters in life. This is about more than working your body – everything we practice physically in yoga is intimately informed by an ancient, rich and fascinating philosophy going back thousands of years and yet more relevant today than ever. I weave aspects of this philosophy into the teaching of breathing techniques, physical postures, relaxation and meditation. Through my classes, my aim is for you to feel wonderfully stretched, spacious and strengthened, your breathing smooth and regular and with a deep sense of calm and alignment with what matters in life. 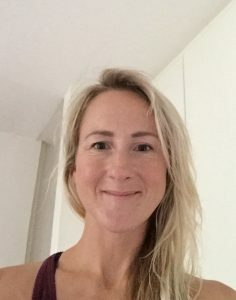 I have been teaching Pilates for 18 years and teach clinical Pilates which was developed by physiotherapists and fitness experts to rebalance the body by improving posture, muscle tone, flexibility and core stability. The slow and controlled approach can also help to relieve stress and tension, help with back problems, assist with injury rehabilitation and improve posture and body awareness. 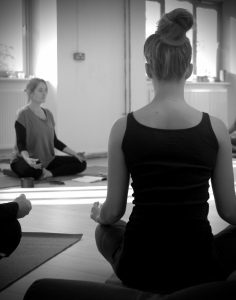 It is suitable for all ages and abilities and I have extensive training in pre-and post natal, back care and the The older adult and hip and knee replacements..
My classes on Thursday will start at 9:30 AM for an hour and include mindful meditation to help with stress and relaxation. Private Appointments are also available and please contact me for more information. 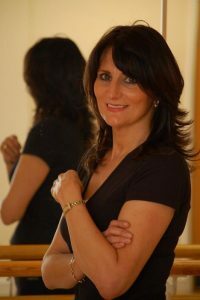 For more information please visit my website on www.janetbutlerpilates.co.uk, Or facebook.com/janetbutlerpilates or contact me on (07968) 372039. The mind is our most precious and valuable resource, through which we experience every moment of our lives. So we need to look after it. How well are you looking after yours? We will look at how we can nurture the body and mind in order to feel more mindful, relaxed, less stressed, calm and more aware. Cost is £40 for the course .Payment will secure place as numbers are limited. Mats, pillows and blankets are provided but feel free to bring your own for extra comfort, or you can do the session seated. Please let me know if you will be doing the session seated. In this Gentle class, we combine slow flow with specific posture work. The class proceeds at a slower pace than the Hatha/Vinyasa class, taking longer over poses and transitions between them. This class is perfect for beginners or if you just feel you want a more gentle experience on the mat. In many ways, a gentler class can be more advanced in that we spend more time really enquiring into the poses, breath and movement. 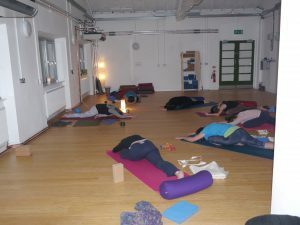 I teach the Saturday morning classes as one-off classes – a kind of lucky-dip mix of yin yoga, hatha and vinyasa flow -the class is different each week but I hope will always leave you walking out of the River Room bouncy, light, relaxed and refreshed into the rest of your weekend! This is a mixed ability class and so beginners are welcome although a degree of physical fitness is advisable. Drop-in £9 or if you have paid for a block of my other classes (see River Room website for information www.theriverroom.org.uk) you can use the ‘tickets’ for Saturdays. hope to see you on the mat on Saturday mornings! Sonia’s unique style has been created over the years as a blend of Ayurveda (Traditional Indian Medicine Health practices) and Seasonal Yoga. Her classes are a blend of long heldremedial poses, slow restorative vinyasa sequences andstrong core work designed to connect into and bring outstrength and balance. 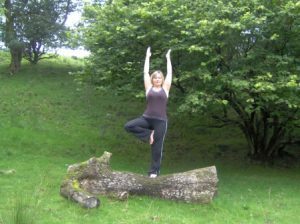 Sonia now incorporates her extensiveAyurveda and Yoga knowledge, massage techniques, seasonalposes, diet and lifestyle practices and breath work to help each student find their best way of easing imbalanced, strained, misaligned, stressed or painful bodies back into balance. 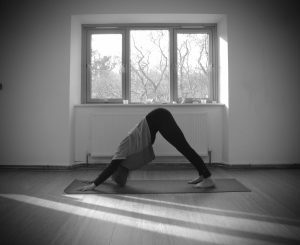 The style of Yoga taught in the classes below include long held remedial poses, slow restorative vinyasa sequences and strong core work designed to connect into and bring outstrength and balance. Also taught in class are massage techniques, seasonal movement, diet and lifestyle practices and remedial breath work to help you find your best way of easing imbalance, strain, misalignment, stress or pain back into balance. I qualif ied as a chartered physiotherapist in 1999 and specialised in orthopaedics and trauma. My great passion from an early age was horse riding and through that I collected numerous injuries, imbalances and tight areas all of which were much improved when I started Pilates. I continued daily Pilates throughout both my pregnancies and caesarian rehabs and then as my strength program for my current passion, fell running. I qualified as a teacher with Body Control Pilates in 2015 and have run classes in Bentham, Milnthorpe, Lancaster, Ellel and now Halton. I still work part time at Spire Fylde Coast hospital in Blackpool and I do private 1:1 Pilates sessions. Body Control is my preferred method of teaching Pilates as it places emphasis on correct alignment and muscle use so teaching the body to be efficient as well as strong. Pilates can range from an all-over “tone-up and de-stiffen” to a super hard abdominal and core workout for those in training for other sports.